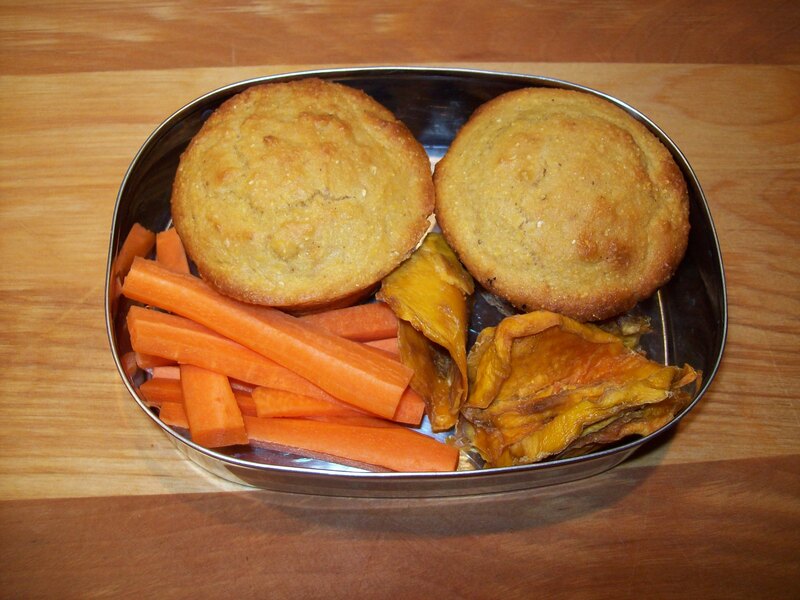 Picnic muffins, packed here with carrot sticks and dried mango. These muffins are so named for two reasons: 1) They actually are great for picnics; and 2) They sort of remind me of holding a whole summer picnic in my hand. With the cornbread, the chicken, the barbecue sauce, they’re a complete meal and a complete flavor experience in a small and easily portable package. Plus, they’re easily made in advance and frozen, so they’re an excellent lunchbox item to have on hand for really busy mornings — you could have everything go totally haywire in your house, and still send your kids out the door with a pretty fabulous lunch if you happened to have a bag of these in the freezer. 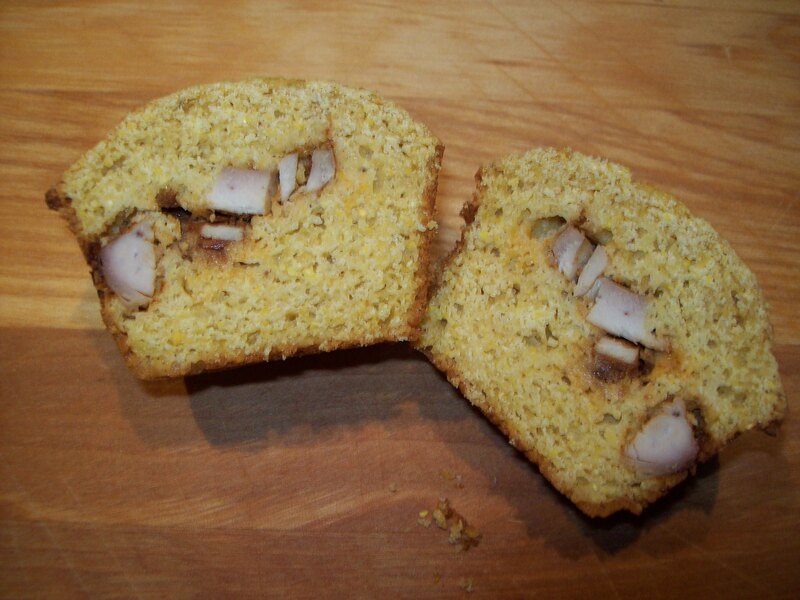 L. and P. are suckers for these just the way they are, but you could fill a corn muffin with just about ANYTHING your imagination (or your kids) can come up with. I’ve chosen barbecue chicken, but the easy way to branch out from that is obviously pulled pork. Taco meat would be excellent, or spicy beans from chili; leftover turkey and cranberry sauce; even just a few cubes of ham would be a fine way to go. The important thing is that it’s a full, hand-held meal that will keep everybody smiling. Preheat the oven to 375 degrees. Lightly grease or line 12 muffin tins. In a large bowl, whisk together the flour, cornmeal, baking powder, and salt. Make a well in the center and add the honey, eggs, milk, and butter or oil. Mix thoroughly, just until all the ingredients are moistened. In a separate bowl, combine the chicken and barbecue sauce and stir thoroughly. To make the muffins, spoon about 3 tablespoons of batter into the bottom of each muffin cup. Top each with 1 heaping tablespoon of the chicken mixture, then cover with an additional 3 tablespoons of batter. Smooth the tops of the muffins, making sure no chicken peeks through. Bake the muffins at 375 degrees for about 20 minutes, until golden brown and set. Allow them to cool slightly before removing from the pans.